Calumet Photo Germany briefly listed the Nikon D750 available for sale with specifications. We were tipped off by Nikon Rumors on the translation, and the features match what many had predicted. The D750 will have a 24.3 MP FX-format sensor. The LCD screen on the D750 will measure 3.2 inches with 1,229K dots, but the key word is tiltable. This will be the first pro-level DSLR from Nikon with a tilting LCD. The D750 will also feature dual SD card slots. It will not use CF or XQD cards as some speculated. The D750 overall design will be compact and feature weather sealing to prevent dust and moisture from entering the body. The shutter will have the improved design (most likely similar to the D810). The AF system will have 51-points and be based on the MultiCAM 3500FX as the D810 and D4s. It will also use the 91,000 pixel RGB metering sensor including the highlight weighted mode as found in the D810. The new Nikon EXPEED 4 image processor provides more power for encoding video at high frame rates up to 60p at 1080 HD resolution. Other frame rates include 24, 25, 30 and 50 fps. The maximum frame rate is confirmed at 6.5 fps, not requiring an external battery. New picture controls bring the total to seven types including a flat profile specialized for video. Changing aperture while recording video is also possible, as well as exposure preview in picture live view. A stereo microphone is included in the camera body, in addition to an external mic. The D750 will provide a native ISO range of 100-12,800 and also have an expanded 50-51200 range. As an action camera it will be optimized for low light performance including low noise at high ISO. The Nikon D750 will be announced officially soon and at that time it will be available for pre-order from select retailers. 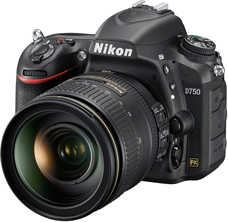 Find where to preorder the Nikon D750 and find current information.